*This interview was originally published on March 2010. NINA RICCI ALAGAO-FLORES represented the Philippines in the Miss Universe 2000 pageant in Cyprus. Today, she is a mother of two boys and married to actor, dance artist and businessman Michael Flores. Nina is also an accomplished painter, having launched her first solo exhibit last December in Makati. For this particular series Nina chose seats as subjects "in her belief that these and people share quite a number of similarities in terms of color, diversity, uniqueness, presence, and personality, making them equally interesting." To Nina, painting seats is much like making portraits. See her paintings. The title of the exhibit - "Limited Seats Only" - is fluid in the sense that it literally represents a precise number of seats but at the same time sumptuously invites the audience to guess - immeasurably - what kind of subject would be sitting in each seat and how the subject would treat the seat. I initially "discovered" Nina's works via a Facebook friend's photo album that featured Nina's initial exhibit. 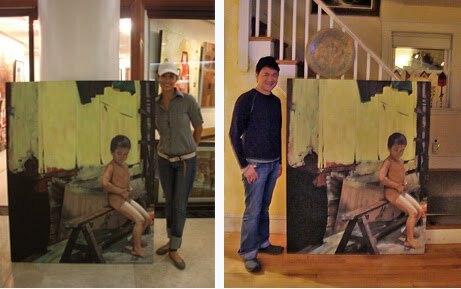 I was instantly drawn to the painting entitled "Totoy," which depicts a poor young boy, naked, perched on a wooden bench next to a shack. I love the piercing realism of the image which reminds me of the extreme poverty that I had witnessed growing up in the Philippines. I am mesmerized by the child's expression and position of his hands. I didn't waste any time contacting Nina, as I was resolved to acquire "Totoy" to add to my humble collection of paintings. "Totoy" arrived safely in my house - inside a large crate - on the first week of February 2010, and just as I had expected, it has now added much warmth and beauty to my home, thanks to Nina's artistic vision. RAFA: When did you first realize you were an artist and how did you begin? NINA RICCI: I believe I have always been an artist, from the time I could already scribble images on paper as a little child of maybe four years. Actually being an artist is genetic, I got it from my father, who was also my first, should I say, mentor. He is also my inspiration, as being an artist is, to him, an unrealized dream, and I feel that is for me to fulfill. RAFA: Which artists have influenced you and why? NINA RICCI: As for influences, they are usually the same artists I look up to. Although we're different in terms of style, I look up to Philippine National Artist Fernando Amorsolo. His is the kind of patience, passion and prolificacy I would like seen in my works. Another artist who really impresses me is Claudio Bravo, a Chilean artist who has lived his life in different countries. The cultural richness of his influences are very distinct in his works, but more importantly he is known for the verisimilitude of his works. My path is very similar to his in that I also want to achieve the "real" more than the "realistic" execution. RAFA: What inspires you to paint and and what mental processes are involved in its development? How do you keep motivated when you start feeling unproductive or uninspired? NINA RICCI: Quite a lot of mental processes are involved when I put a collection together, but if anything is important to point out, it is that I don't throw away any idea no matter how miniscule or negligible it seems, acknowledging that it will be useful later on if not at the moment. I never feel uninspired, just unproductive at times, and that's when I remind myself of that thing called a deadline. Haha! Apart from God and knowing how blessed I am with all His wonderful gifts, I draw inspiration from things that transpire on a daily basis. Little things like a smile from a stranger is enough to make my day. RAFA: How long does it typically take you to complete a finished work? How do you know when a piece is done? NINA RICCI: I really can't give a definite answer as every piece requires different attention. Also size is a major factor to consider. It has always been a dilemma for me trying to decide whether a painting is done or not. Even as I have already decided that a painting is finished I look back later on and view it from a different perspective and end up making changes. When most things are downhill towards the end, in painting it is a bit steep. RAFA: Why are you drawn to painting? How would you describe your own work? NINA RICCI: I am drawn to painting because I know that through it I have the gift of self-expression. Whenever I see something beautiful I know I can freeze that moment in a painting. Currently I would describe my work as a testimony of my hardwork, discipline and passion. Truthfully that isn't something one achieves overnight, but I eventually got there, and it is a continuous process that molds me into an even better artist and person. In terms of style I am still keeping within the "real" technique. Maybe I will experiment on different media eventually, but there will always be a trace of the "real" technique in every piece, I guess that's something I will have a difficulty parting with. RAFA: Could you talk about your first series of paintings and what you are trying to achieve with them? NINA RICCI: For this particular series, I chose seats as subjects because I believe that seats and people share quite a number of similarities in terms of color, diversity, uniqueness, presence, and personality, making them equally interesting. Painting seats is a lot like making portraits. RAFA: What other interests do you have besides painting? NINA RICCI: Oh, I love doing many other things that don't quite connect with painting, like cooking. I love cooking! I love to write although it is not necessarily one of my best gifts, singing, sewing and re-structuring pieces of clothing. I still collect Barbie dolls, would you believe?? I am a person who keeps learning, and there's nothing I refuse to learn if I can learn it. RAFA: How have you handled the business side of being an artist? How do you feel when one of your paintings is sold and that you may never see it again? NINA RICCI: Well, I know I should have someone handle that. It has been said that artists are not the best people to handle their affairs. About selling and parting with my paintings, my emotions are quite mixed. Sad, because like you said, I might never see it again. But for the most part, happy, because I have always believed that the work of my hands are meant to be shared, and because I know that I am letting go of it to someone who appreciates my work. RAFA: What advice would you give to an artist just starting out? NINA RICCI: Well, don't let any amount of discouragement stop you from pursuing your passion. If you see a beautiful work of art done by your contemporary, which in your belief is better than your own, choose to be inspired instead of let down. RAFA: What sort of message do you wish to communicate through your art? NINA RICCI: I wish that people would see my heart through my works, that they would share my cause and ideology. Art after all is an expression of oneself. RAFA: What message would you like to give to our Critical Beauty readers? NINA RICCI: Thank you for your support! Critical Beauty would like to thank Nina for granting this interview and for sharing her work with pageant fans. Inquiries regarding Nina's paintings may be addressed directly to Nina herself at alagaonina@yahoo.com A generous portion of the proceeds from the sale of the paintings will benefit the victims of typhoon Ondoy which ravaged the Philippines in late September 2009.